Genevieve Graham is a new author whose first book, 'Under the Same Sky' just hit book stores January 2nd. She graciously agreed to do a Q&A with my Goodreads group Nothing but Reading Challenges and, with her permission, I'm posting part of it here. To view the whole Q&A Click Here. A beautifully written, riveting novel," according to Madeline Hunter, NY Times Bestselling author. The story is set in the 1740's and focuses on Maggie Johnson, a girl with "the Sight" who lives in the Carolinas with her very poor family. It also tells the story of Scottish Highlander, Andrew MacDonnell. The two know each other as well as they know themselves, having dreamed of each other since childhood. They see each other's thoughts, channel their energies to one another, sometimes can even rescue each other from danger and death. 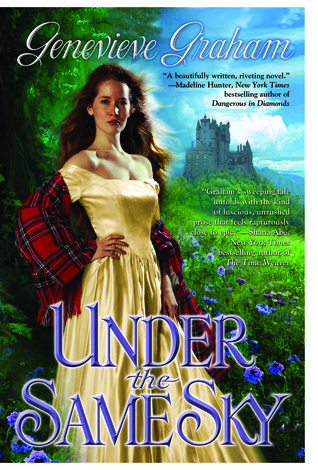 When Andrew leaves Scotland after his country is devastated in the Battle of Culloden, he must journey across the Highlands, the Atlantic, and the vast colonies to find the woman he has always loved. Maggie survives a horrific trauma and is rescued from white slavers by the Cherokee, who take her in and encourage her Gift. But the 18th century was an unkind time, especially for women, and Maggie is forced to defend herself once again, this time with dire consequences. Will Andrew reach her in time? Will they ever touch beyond dreams? Me: Thank you so much for joining us today. I look forward to discussing 'Under the Same Sky' with you. We're honored you could chat with us today. I truly loved your book and wanted to know if there will only be two books or is this just the beginning of what will be a larger series? Genevieve: Hi Lisarenee! Thank you so much for having me here tonight! I've never done anything like this, and it's really exciting for me! I have a third written, “Out of the Shadows”, and the fourth recently announced its presence to me. Penguin hasn’t read book #3 yet. Originally I’d planned one book only. When the second one became necessary, I branched out and included one of the major characters from the first book, to tie them into “companion novels”. That book is “Sound of the Heart”, and it’ll be in bookstores May 1 (available online for preorder!). I definitely hadn’t planned on the third, but I literally woke up one morning with the opening screaming in my head. This one focuses around the sister of the heroine in “Under the Same Sky”. "Under the Same Sky" was originally twice the length it is now. :) I got carried away writing about the workings of the Cherokee village and their customs - I must have written seven chapters based on them. Then someone asked me what they had to do with the story, so I realized I had to cut them. I saved them, though - you never know when those kinds of things will come in handy! But yes, I would like to write something long like Gabaldon's. The tricky part for me is that I'm not great at writing plot, and to make a book that long you have to go in all different directions. Never say never, though. Me: If you never use those chapters, maybe you could eventually post them on your Website? I always love it when authors post their 'deleted' scenes and such. I noticed you used quite a few animal totems and I liked how all the magic (those of the Cherokee & the kind Maggie and Andrew share) ended up being tied at it's most basic form together. Why did you decided to create a tie in? By the way, I loved the way you did that. Genevieve: Thank you, Lisarenee! And thanks for the idea on "deleted scenes". I've already incorporated some into the next two books, which proves to me that they were meant to be written! But yes, if I find a suitable scene, that might be a fun thing to put in my newsletter or something. For me the most magical part about writing this book was that the story told itself. I was merely the medium, the facilitator via my keyboard. I didn’t know I’d be heading into Cherokee ground when I started, but every time I saw Maggie a raven lurked in my mind as well. When Andrew appeared, I had the sense I was in the presence of a wolf. I know that sounds kind of weird, but it’s true. When I started researching the Cherokee and learned about the animal totems, everything fell into place. Me: Speaking of magic, as the book progresses the magic bond between Maggie and Andrew grows and they finally can speak to each other. Was that because they weren't meant to find each other until the moment was right? Genevieve: It had to do with geographical proximity. I hate to think that if Andrew hadn’t had to travel to get to Maggie, they might never have met, but that’s the way it was. I also think that as they grew older and accepted this gift, they were able to train themselves to focus and improve what they could sense. Me: Is it safe to assume then that we'll be seeing more of Maggie and Andrew in the sequels? That we'll find one another in that big somewhere out there..."
While reading the story I felt it definitely fit well with the story. Do you listen to any music while creating your stories or ever associate any music with them? Genevieve: That's beautiful and definitely appropriate! I'm very into music, especially classical, since my university degree is in Music Performance (I played oboe). But when I write I can't have music playing. I guess it could be because I know too much about the pieces and get distracted. I work best when I'm all alone, with no distractions at all. Me: Why did you pick the US and Scotland to be the settings for this story? Am I correct that Scotland had a little something to do with Diana Gabaldon's series? Genevieve: I don’t mean this as a cop-out, but the truth is I didn’t choose where to put them. They were just … there. But yes, Scotland came from my obsession with all-things-Gabaldon. She completely made me into a Highlands buff through her incredible work. But Maggie appeared to me on a windblown grassland, her hair lifting in wisps with the hot breeze like the dried out grasses surrounding her sad little house. The customs around her were unlike those in Scotland, and when the Cherokee appeared, well, that made it final. She was definitely far from Andrew, surviving the wilds of the colonies. Me: The funny thing is that I hear that sort of answer from authors all the time. I'm always curious, however, if there is something more. I find that interesting and just accept it that good authors are visited by a muse that in essence whispers in there ear, so to speak. Do you know where I can get one? Just kidding about getting the muse, but I truly do believe that for some authors it just comes naturally like that. I think some musicians have the same sort of thing happen as well. Genevieve: Maybe because my background is in music it carries over. Music was always something that came naturally to me as well. To me the entire process is amazing. My favourite example was when I was writing a specific scene and I sensed two characters on the sidelines, wanting in. I kept pushing them to the side, saying they had no place in the scene, and I couldn't write for two days. Finally, I let them in, wrote what I felt, and after that I couldn't stop. The muse usually knows better than I do! Me: What do you feel makes a great hero & heroine in a romance and how did you incorporate it into your books? Genevieve: I think a great hero and heroine are like any other person on earth, and the only way to create that kind of hero is to make them real in your head. What makes any person great is their individuality and personal strengths. No one wants to read about wallflowers or complainers who never do anything for themselves unless there’s a really strong lesson in the story. I want my characters to be entirely independent, intelligent, principled, and courageous. That means their eventual connection with their soulmate will only make them stronger. Personally, by the age of 27 I’d decided never to get married, because I figured men and relationships were too much trouble. I was entirely prepared to live my life on my own. Then I met my soulmate and I’ve never looked back. He and I are still independent, but I can’t imagine life without him. Me: So when we read one of your books we shouldn't expect fluff, but a little more (not sure if this is the proper term) sustenance to the story? For instance, life on the frontier was by no means a walk in the park. Bad things happened and you try to have a more realistic reflection of life in your books with characters whom we can relate to and admire? Genevieve: Exactly. The cover, while beautiful, gives the impression you're about to read a "regency" type romance. Some people will be a little surprised when they see that I didn't pull punches. My latest (5 star!) review on Amazon said "This book isn't for sissies!" Me: I don't know if this is too spoilery for your next book Sound of the Heart, but I don't recall you ever mentioning if anyone Andrew's family (ancestors or immediate family) have the "sight" like him? I remember you saying Maggie's Grandma did and was burned for being thought of as a witch. Did Andrew have a history of anyone in his family having the 'sight' as well? Will Dougal have any powers? Genevieve: In "Under the Same Sky" I touched briefly on how the brothers could sense what the other was thinking, how they didn't need to discuss things, but that they never talked about it. Andrew was always secretive about it because he didn't want to be associated with the crazy old fortune teller in a nearby village. Me: LOL and there's the hook that makes me wish I had the next book already. Who are some of your favorite authors? What are some your favorite books? 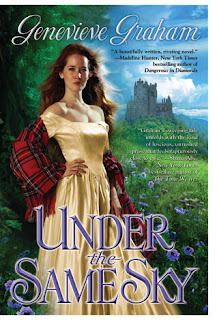 Genevieve: Diana Gabaldon, Sara Donati, Penelope Williamson, Jennifer Roberson, Kaki Warner ... I do like quirky books like “Come Thou, Tortoise”, and I loved “The Help”, but mostly I’m into Historical Adventures. And by that I mean I like the "real", rough historicals. I'm not one for "regency" romance. I loved the entire "Outlander" series, as well as Donati's "Into the Wilderness" series. Me: Thank you for taking the time out of your busy schedule to chat with us and please thank your family as well for sharing you with us. Genevieve: Thank you all so much for being here tonight. I hope you get the opportunity to read "Under the Same Sky", and I look forward to hearing what you think! If you haven't yet picked up a copy of Genevieve's latest book, you may wish to check it out. Her second book, Sound of the Heart, is due out on May 1st.